Whooping Cough Vaccine Recommended For Seniors : Shots - Health News An expert panel is expanding an earlier recommendation that seniors be vaccinated if they have contact with very young infants. Now just about all seniors will be candidates for vaccination. Adults and teens have been on the recommended list for years already. 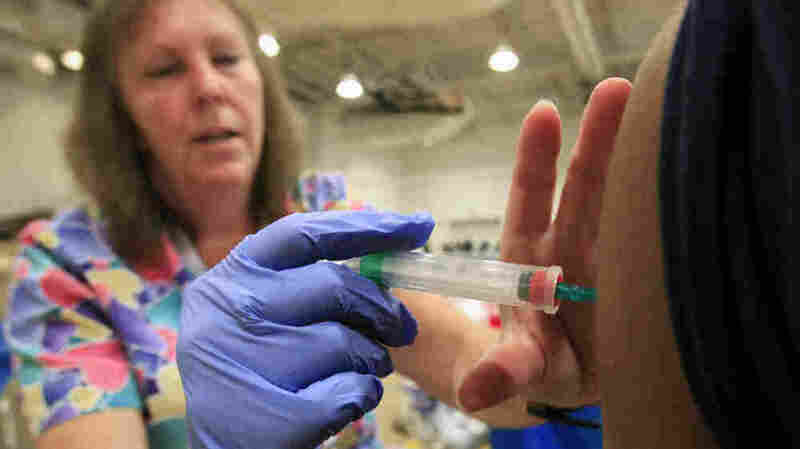 Nurse Susan Peel gives a whooping cough vaccination to a student at Inderkum High School in Sacramento, Calif., in 2011. Now it seems likely such shots will become routine for senior citizens, too. Now just about everybody should be getting vaccinated against whooping cough. Advisers to the Centers for Disease Control and Prevention are recommending all adults 65 and older be immunized against whooping cough, or pertussis. The panel is expanding an earlier recommendation that seniors be vaccinated if they have contact with very young infants. Adults and teens have been on the recommended list for years already. The so-called T-DAP vaccine protects against tetanus, diphtheria and whooping cough. It's routinely given to children starting at 2 months. But three shots, usually done by 6 months, are needed to be sure a child's immune system can fight off the bacteria that cause pertussis. To protect the youngest and most vulnerable children, it's important that relatives and other people in the community be vaccinated to prevent spread of whooping cough. Researchers believe whooping cough occurs more frequently in older adults than has been previously recognized. That may help explain outbreaks of pertussis in California and other states in recent years. Also, research has shown that immunity to the bacteria that cause whooping cough can wear off over time. That's why adults need to get booster shots. The CDC usually follows the advice of its advisory panels and could issue formal recommendations later this year. In 2009, there were 16,000 cases of whooping cough in the U.S, with 16 deaths.